Biblioigloo is one-of-a-kind library in the whole Alpine area: a transparent sphere of 11 metres in diameter and 5.5 metres high, built in the mountains among meadows and woods (in winter it is located next to a ski slope) in Prati di Gaggia, at an altitude of 1,333 m. It was inaugurated December 20, 2014 and is the result of a public-private agreement between the Biblioteca Intercomunale Altopiano Paganella Brenta (Altopiano della Paganella and Brenta integrated library system) and the Valle Bianca Spa company, one of the two local ski-lift companies on the Paganella, also with a lift connection from Andalo (Laghet) to Prati di Gaggia, at only a few metres from the library. Biblioigloo is a real public library with high quality services; managed with love and care, and based on a truly original project idea, it gives ample space to families with children also thanks to the many books devoted to them, small play areas and workshops organized by qualified staff. 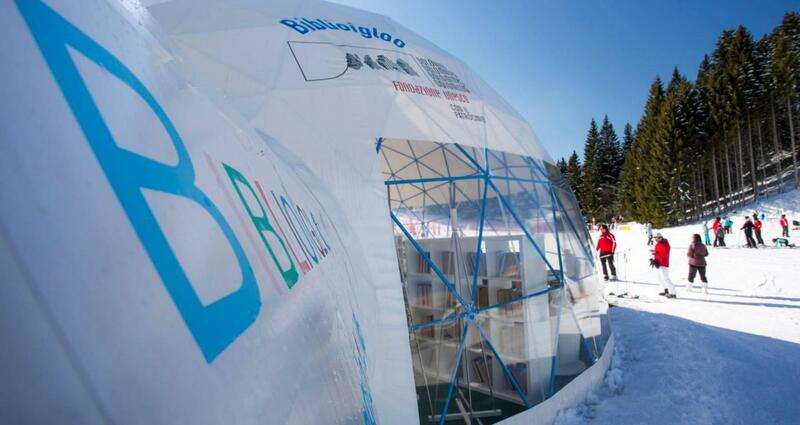 The Biblioigloo is part of the PAGANELLA KINDER CLUB circuit with the Baby Park Dosson and the Baby Roccia mini club - the daily ticket (€ 9.00 with card - € 11.00 in full) allows access to all 3 facilities of the circuit.